This is a battle between two reasonably similar teams. They may play different formations, but they have the same problems – and, most interestingly, will look to play down the same flank. The first similarity the lack of a prolific number nine. Milan Baros and Helder Postiga have both started all three games, but Milan Baros has had two shots in the competition (no goals) and Helder Postiga has had three (one goal). They’re simply not a consistent goal threat, and the main part of their job is holding the ball up, drawing fouls and linking with the wide players. The second similarity is the absence of a creative attacking midfielder. We knew this about Portugal before the competition started, but for the Czechs it’s a new development. Tomas Rosicky’s injury means he’ll probably be on the bench tonight, and replacement Daniel Kolar struggles to replicate Rosicky’s impact upon matches. 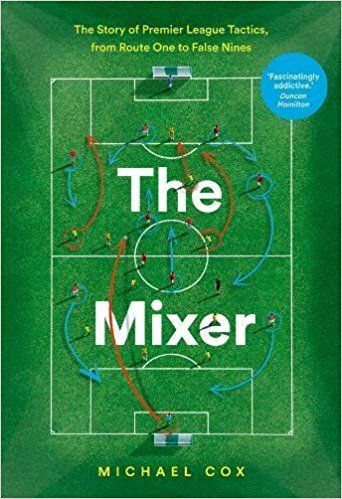 The creative midfield battle will be decided primarily by the two ’second function’ midfielders – not the holders, Miguel Veloso and Tomas Hubschman, but the men just ahead. Jaroslav Plasil has enjoyed a good tournament, creating 14 chances in three games, while Joao Moutinho was excellent against Holland and should get time on the ball here. 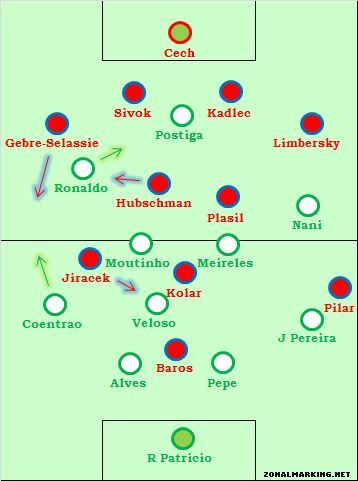 It’s difficult to see who will close down Moutinho - Petr Jiracek will be concerned about Coentrao, Hubschman will protect the space in front of the back four, particularly the zone Cristiano Ronaldo wants to move into. Moutinho should be free, and will dictate the tempo of the game. The key battle is likely to be down the left flank. This is Portugal’s biggest strength going forward – they have the goalscoring potential of Ronaldo coming inside, and the overlapping threat of Fabio Coentrao bombing down the outside. But this means they’re also weak defensively down that side: all four goals they’ve conceded have originated from that side of the pitch, and Ronaldo’s non-tracking against Denmark was a problem Paulo Bento should have resolved earlier. As it happens, the right has been the strongest area of the Czech side. Petr Jiracek has been excellent on the wing since he was switched there midway through the opening game against Russia, although he played two different roles in the subsequent games – he drifted inside quickly against Greece, but stayed much wider against Poland. He managed to score in both games, but it seems better for the balance of the side if he comes inside, so Theodor Gebre-Selassie can energetically stretch the play from deep. Gebre-Selassie has been one of the competition’s best attacking full-backs, and while he’s in for the most difficult defensive test of his life up against Ronaldo, Michal Bilek will probably encourage him to move forward and test Ronaldo’s defensive positioning. You can’t leave that position bare against Ronaldo, of course, so Hubschman should be able to drift across and cover, potentially allowing the Czechs to create a 2 v 1 situation against Coentrao. Moutinho, unlikely to be concerned about forward runs from Hubschman, may have to help out. But Jiracek is a hard worker without the ball, and he’ll track Coentrao back. 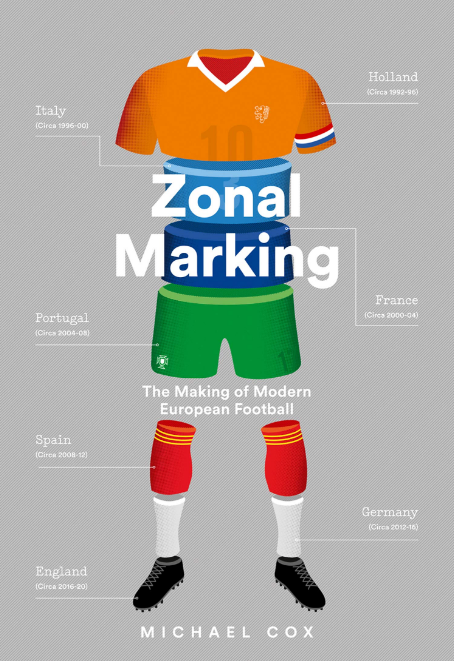 With the support of Hubschman, the Czechs might fare reasonably well against the strongest part of the Portuguese side, although Ronaldo remains a huge threat. Portugal might even be better switching the ball out to Nani – both Moutinho and Veloso are capable of good crossfield passes to that side, where the Manchester United winger should be able to take on David Limbersky in a 1 v 1 situation. Limbersky is inexperienced at this level, though he played well against Jakub Blaszczykowski in the Czechs’ previous game. The final part of the battle on the flanks will be Vaclav Pilar against Joao Pereira. Pilar plays an interesting role, staying very wide and then looking to run in behind the full-back onto through-balls. Does Pereira stay narrow and shut off that space, risking Pilar getting the ball into feet too easily, or stick tight and risk being outpaced on the turn? This might not be the most open game – both sides are broadly counter-attacking, and want their wingers to run with the ball. Both thrive when they have space to run into – Bilek and Bento will probably want their sides to sit deep early on, to stifle each other. What if Ronaldo trades places with Nani to confront the inexperienced Limbersky? Might not have Coentrão’s help, but Meireles is not that bad of a player. And Nani does defend better than Ronaldo. I had exactly the same thought when Portugal were playing the Netherlands, Ronaldo could have swapped flanks to confront their young left back Willems. I can’t see Czech Republic winning this. There biggest threat will be as you said ZM, the combination of Jiracek and Gebre-Selassie down the right, as they could overload Coentrao. But they don’t have a particularly good threat in the penalty area (Baros has been poor) so I think Alves can afford to move outwide to cover. Portugal also have Veloso who has played LB before and can easily drop in and cover, with Kolar not a big threat either. I think Portugal have two big theats down the wings that Czech republic will find very hard to defend against and we could actually see a surprise goal from someone like Meireles, who could sneak forward past Placil (not great at tracking runs) and grab a goal with a late run. I also hope Portugal will utilize Moutinho more, there was a great spell against Holland when Portugal dominated the ball with Moutinho at the heart of it, they should be brave and try this more. Finally I think Portugal have a good plan B which helped them come back from behind against Denmark. They throw on Oliveira and Valera in forward positions and go more direct, it is a useful option and could prove vital if Portugal are chasing the game. here’s hoping you’re wrong kaneprior. I put 2-1 for the Czechs (fingers crossed I’m right and that Pilar scores cuz he’s on my fantasy team, got him for a steal at the start of the tournament and has worked out well for me). Any predictions? ps – you forgot to add the “check out my site link”! Kolar could perhaps surprise, but I really think Baros is a poor player. He is a shadow of his former self and Czech Republic have done well by getting their wingers into the dangerous positions not him. Besides I wouldn’t think they would leave both free, either Veloso or Alves could move out to the left. Haha I like to miss it out now and then, didn’t think it would be worth it with this preview. no … don’t have twitter … not really into the modern computer stuff believe it or not … mobile phone huh? what? me? Just saw they’re starting Darida instead of Kolar … hmm, we’ll see. Anyway, good luck and see you around tomorrow for the results! can i ask you some thing ZM please use the name of the positions rather than the number as a guy like me who hasnt read any tactical book gets confused . i hope you make the necessary adjustments . There is a glossary on the site. Now that you have mention about it, Would like ZM to add tornante to the list. I love the group stages of World Cups and European Championships. Gripped by football fever, we are treated to matches everyday and it’s great. However, this is where the drama and tension really begin. Knockout stages always seem to me to be much more of a chess-match between respective managers and I love it. There are some interesting match-ups all over the park tonight. Joao Pereira has some real quality – he played an excellent through pass for Ronaldo the other night, did he not? – and I was impressed with his performances for Sporting in the Europa League. Not surprised that he’s been signed by Valencia. I think his battle with Pilar could be just as interesting as Ronaldo’s with Gebre-Selassie (indeed, the battles on the whole of both flanks should be good). Have to say, I’ve never heard of the Czech right-back until this tournament and he’s been one of the standouts. The Portugal midfield three should be too good tonight. All of them are underrated if you ask me. Would love to see them together at club level. Nani’s playing as the left-winger for Portugal. But Ronaldo seems to playing like an attacking midfielder at the moment (4th midfielder), there is no right winger! OK, now back to usual after 20 mins. Nani on the right, Ronaldo on the left. I’m sure ZM will elaborate on this, but Almeida’s introduction was crucial for Portugal today. He kept the two central defenders busy with his aerial threat, which helped Portugese players find space in the box for crosses. Thank you, I have just been searching for info about this topic for a long time and yours is the greatest I have discovered till now. However, what in regards to the bottom line? Are you sure in regards to the supply? I¡¯m happy I found this blog, I couldnt find any information on this subject matter prior to. I also run a site and if you want to ever serious in a little bit of guest writing for me if achievable feel free to let me know, i¡¯m always look for people to test out my site. Please stop by and leave a comment sometime!